Using 3D printing technology combined with recent development in cellular science (as in “cells” not “cell phones”), Atala is leading a project that is “printing” new organs. They demonstrate a kidney that they were printing during the presentation and even bring in a printed-kidney-transplant patient. I wrote this some years ago and though I have not lived with such roommates for some time, I find humor and reason to be grateful in it. While it was originally written with a certain group of roommates, I have modified it through out my time at school so it no longer represents any one group of roommates but rather my general frustrations with roommates over time. I have put a little effort into updating some of the references. Okay, they may be five year olds, at times. But every day that I wake to an apartment in various levels of disarray I wonder how old my roommates really are. Well, mostly I wonder how they can be so rushed and harried as to seem so fragmented and disorganized while still not accomplish hardly anything at all. Though I am limited on my experience of life, I find that by comparison, if I were so rushed and harried as they, such would be indicative of substantial projects underway in my life, the boons for which are lacking when examining the lives of those in question. It would make sense to me to not be able to put your coat on a hanger in the coat closet when you came in from outside, if you were about to make a tremendous breakthrough in your latest research in nano technology. That is not the case. Instead one simply cannot be bothered. It would make sense to me to not be able to put the bar stools you used to rest your plate on when you ate dinner while watching TV if you were suddenly called away by the FBI to assist in a crime scene investigation. This is not the case either. Instead one is just too lazy. It would make sense to me to not be able to complete homework that was known about for more than a week, if you had been held up for the past week by kidnappers demanding ransom money. That is certainly not the case (otherwise, one would not have been able to leave one's possession strewn throughout the apartment like a bread crumb trail to lead an unsuspecting mother to a magnificent trap). Instead one was too easily distracted. The part that really gets me is not so much that these, and many other, simple things go undone. Quite to the contrary, I am not a big fan of doing them myself and thus it is a of little wonder to me to see that others do not enjoy doing them as well. I have, however, learned that there is a deep and profound ease to life when the simple things are taken care. For example, having put my coat in my closet where it belongs, allows me to know exactly where to go to retrieve it. I never have to go wondering from room to room calling out "coat, where are you" or, worse yet, crying: "has anyone seen my coat (that I casually through on the counter as if I had no manners or respect for the other people living here because I had some how forgotten that I no longer live with my mother who used to take care of such things for me)". Another example, by putting the bar stools back around the counter from whence they came (though I personally try to avoid using them to eat off of while sitting in front of the television), I never have to be embarrassed where company comes over and it looks like I have done nothing all week but sit in front of the television eating. One final example, if I do my homework, at least a little in advance (see my [past] blog called "Why I've Learned to Procrastinate", I was supposed to have written it, but I have not) then I can go to bed at a normal time, wake up at a normal time and still be alive enough to participate in whatever fun things are going on. I was "wondering" aloud one day why such living space negligence happens, as I do frequently in increasingly disgruntled tones, and was immediately charged with "lambasting," a word which here means "beating the already overworked and abused with a bamboo cane". One roommate told me that he had an incredible 14 credits, oh the horrors and my sincerest apologies. For those who do not know or may have forgotten, 14 credits hours is supposed to be equivalent to a 42 hour work week (14 in actual class time and 28 in homework or out of class learning). Though, we all know that very few classes use their full allotment of out of class time. Unless you are taking all chemistry, higher math classes or the like, one does not come close to spending the full allotment of time on homework. Even if one was truly putting in 45 hours a week in schooling (a little extra for the benefit of a doubt), about the same as a full-time job, what makes such a person so incredibly busy that they cannot put their coat on a hangar in the closet (or at least throw it on their bed or chair so the rest of us, namely I, do not have to deal with it)? Another told me that he had a job. Wow, I am backing away from this one. This man is going to school AND working a part-time job (about 20 hours a week, unless he can cut it down to fewer hours, because he is working too much). Let me get this straight: he has no wife to talk with, children to play with, exotic animals to tend to, plants to prune, dying family members to take care of or even particularly needy friend to help; but he has a "job" (I wish you could hear the sarcastic tone this word makes in my head as I type it) and because he has a job, he is too tired to put the bar stool back in the kitchen or for that matter to even carry his dishes to the sink (let alone, wash, dry and put them away). Ah, the joys of living with big, little boys. New technologies, and the application of older technologies, are allowing us to map the brain like never before. Jones is working to build a collection of brain maps to be able to allow other scientist to better understand the relationship between brain related illness and functions. Havel discusses in length about economic cycles and how we have ended up in our current economic crisis because we spend too much when things were good and thus we were already in debt when we ran out of money. Schwartz discusses the disturbing trend of the degradation of wisdom in modern society. He comments that we need both moral will (the desire to do the correct thing) and moral skill (the ability to do it in the correct way). He points out that whenever bad things happen we react by building more rules and more incentives, neither one of which address the underlying problem: a lack a wisdom. Instead, more rules just prevent us from having to think and increased incentives push us to act in our self-interest, stripping away whatever appeal we would make to our personal responsibility. Reid uses a tongue-in-cheek presentation to satirize the economic impact claims of the MPAA, RIAA and other copyright defending organizations. Stoll is like listening to an energetic 6 year-old telling about an exciting day, except he is an old grey haired man. Stoll takes us on a stroll through history to end us with a sobering message: computer driven education will never surpass hands-on education for understanding and enlightenment. Row provides some insights as a lawyer for death row inmates. Chief among these insights is that we should for the earliest intervention possible. Algorithms are progressively doing more for us as computing continues to integrate itself into our world. Slavin talks about some ways that these concepts are shaping our world, literally and figuratively. Clason uses a fictional story line, set in the height of the Babylonian empire, to distill his wisdom on the accumulation of wealth and wise money management. While at times the stories seem unnecessary, they help to reinforce the importance of the point Clason is trying to make without bearing down into boring numbers and statistics. My bank recently started allowing me to deposit my checks through my phone (I know, a cool feature that almost every other bank had, but they give me free checks so I stick with them). I had been really happy when I first got the feature, I could hardly wait to use it. Now, I am considering not using it any more because I found it introduced a void in my life. I live 30 minutes away from the nearest branch of my bank. Conveniently, the bank is surrounded by a fully featured city complete with shopping and delicious food vendors. Thus, previous to my mobile check cashing days, checks meant not only money (which is always a good thing) but also a drive with a friend (or friends) and then often a meal with said party before another drive back home. It was a rare excuse to spend time together. While under the guise of necessity, everyone knew that it only takes one to deposit a check yet we were all glad for the time spent together and the excitement of breaking out of escaping, however shortly, the boring cycle that small towns can lock you into. Now I find myself in a new quandary. While I fully recognize that my previous reasoning was nearly invalid, I am struggling to come up with a new excuse of any validity. No excuse seems to be able to combine sufficient seriousness to justify the drive while still allowing enough levity to not encumber the evening. "Want to go want the wind mills?" is dismissed with, "That's a good date, but not a good group activity." "Want to go shopping and have dinner?" is met with, "If we had money to spend on frivolous things." "Want to peruse a distant thrift store?" gets, "That's a long way for nothing." Even if I break down and call it what it is: "Want to go catch some dinner?" I still have to overcome, "What's wrong with the restaurants in town?" Alas, I will still use my mobile deposits because I would feel lame to not use it (plus, mobile deposits do not cost gas to drive 30 minutes one way), but I will still fondly remember the "good old check depositing days" of yore. In my new work we deal with a lot of taxes. In fairness, I do very little with the actual taxes. No, I have fun building the spreadsheets that calculate them--which I can say is rather nerve racking as the Federal Government is not very forgiving when mistakes are made--but I digress. One of our most frequent taxes is called the International Fuel Tax Agree (or IFTA). It applies to the United States and most of Canada and was developed as a way to avoid the old method of making a truck register for fuel taxes in each state they would be traveling through. So, in general, IFTA was a really good idea all around. One day my boss asked if I could make a diagram that explains how IFTA works so our clients could better understand it. It is no wonder to me that people get confused on how the tax works. After a few minutes, it hit me: IFTA is actually very simple. Instead of thinking about the formulas we use to generate taxes amounts, I just had to think about what the tax was actually taxing (the key is in the MPG calculations). Thus, the grand conclusion is that IFTA is a calculation of fuel consumed while traveling through the state. In other words, how much fuel would you have needed to buy to operate in a given state. Sure, there is some averaging in there, but that is just to make it calculate easier. It felt good to take something as complicated as the robust formulas and summarize it in a handful of words. 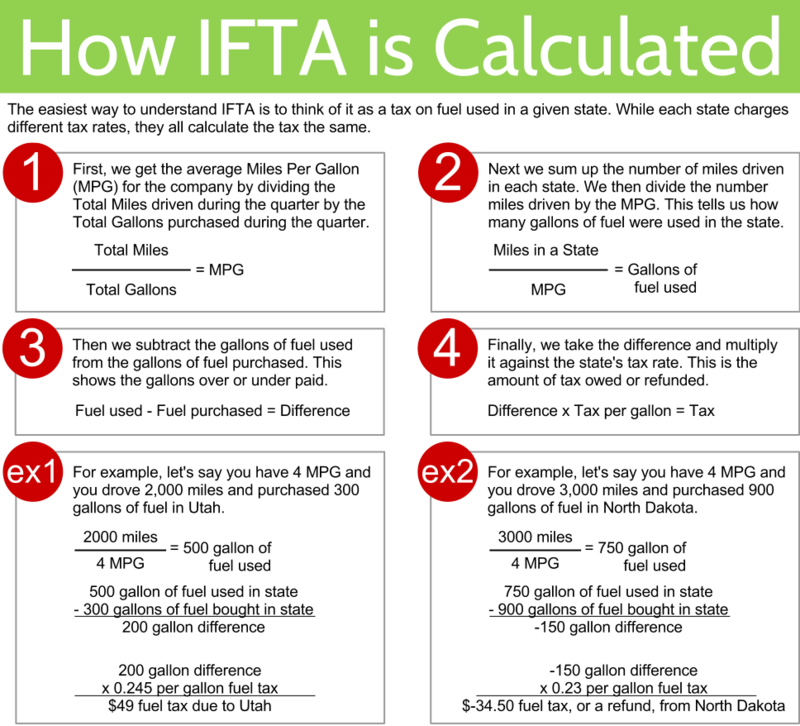 IFTA: A tax on the fuel you used in a state. 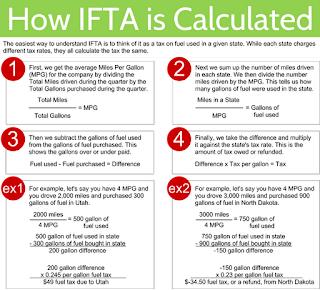 How IFTA is Calculated. ©2012, used by permission. Details available upon request. It turns out, the ability to self-regulate (self-control), make decisions and take initiative all stem from the same, exhaustible, mental resource and takes a lot of physical energy to do. Like any mental resource, however, this one gets stronger with use. Thus, it is better to provide rules and structure for the young and old alike (even while knowing that the rules will be violated) because it helps the mind to become stronger at resisting impulses. As a side note, scientists recently discovered that consuming familiar, favorite materials (i.e. TV shows or movies that we have already seen or books that we have previously read, and that we enjoy consuming repeatedly) will "recharge" our willpower quicker than it will naturally recharge by itself. The benefit, however, does not come from consuming new material even if from in a favorite collection (i.e. a new episode of your favorite TV show). The original article can be found here. A call for young scientists to hold true to their course as the world will need them as guides to the future. It is interesting to note that Wilson downplays the importance of math. He comments that while it is the language of science, one only needs a rudimentary understanding of the language to use it. Instead, it is critical to be able to dream in order to push science forward. Note: I wrote this back when I was an intern for a certain government research facility. I wrote it on the long the (2 hour) bus ride from "the site" and edited the next day on the same, long bus ride. I have included some additional thought in italics. Working for a government contractor (basically the government) has been an interesting experience. Of course there have the normal "we can't do that" and "we have to submit the change for approval" (it took more than 5 months to get approval to change minor wording on a post-training survey) but there has also been an interesting transition as they have been cutting staff. The need and want to cut cost is present in every company I can think of and has the oblivious benefit of making the company more profitable. There is, however, an interesting and unfortunate side effect to these cost cutting efforts: innovation is stifled. Time and again, there is a clear pattern of disparate entities getting together and sparking evolutionary or revolutionary changes seemingly based on their proximity alone. (Duncan Hines revolutionary invention of cake mix came when a baking guy was having lunch with a powdered soap guy and they developed a method of creating the liquid mix and then spraying it onto screen for powdering like the soap guys did; Post-it notes' evolutionary invention came about when one inventor created the weak, reusable glue and the other found a use for it; and many more, if you do some digging.) Ideas that otherwise would have taken a long time to come about, if they ever emerged. Which then confuses me as to why you would be stripping away most of the opportunities for new, innovative ideas by saddling down employees with so much work (by cutting down the help for those tasks) that they have no chance to interact with others. It would seem that instead of cutting everything down, companies should set more people free: free to interact with and learn about other departments, free to dream, free to bear those dreams into reality, free to create new revenue streams. But then, what do I know about "the real world," I am just an intern who created a website in a week that took other departments several months to do. P.S. Can I mention that because the web programmer (namely me) was working with "the site" management while hanging out with the Training department instructors and cavorting with the PR people, he was able to completely redesign their daily internal publication in a way that greatly improved the appeal and readability of the content? How? By asking why people never read the publication. No magic, just someone who could do something being around people with good ideas. The Dabbs couple explore the profound and vast effects of testosterone on men and women from the youngest of ages (in utero) through mid-life. After childhood, they explore the three basic effects that are outlined in the title: creating heroes, rebel rousing and making lovers. While the presented research focuses on men, the Dabbs are frequently cite studies of women to establish a baseline of the norm before showing how testosterone changed the default behavior. This book has greatly expanded my understanding of, and provided fascinating insight to, why both men and women behave the way they do. Interesting tidbit: Alfalfa and clover are estrogen rich and thus birth controlling plants. It is thought that the plants maintained this chemical feature to limit offspring of hungry animals and thus prevent overgrazing. Today, some million sheep go sterile each year in Australia alone from eating too much wild clover and alfalfa. Mistry built a simple device of a projector, camera and small computer that basically allows the computer to break outside the normal confines of screen, keyboard and mouse. This is the stuff of movies. Cohen discusses some of the causes of a lack of empathy, its hindrance as well as benefits. As we are faced with increasingly more choice, studies are increasingly finding people to be dissatisfied. The dissatisfaction comes, in part, because the increased number of choices overwhelm our ability to analyse the data and thus we make poorer decisions. Additionally, because there are so many choice, it is easy to wonder if you could have made a better choice. Finally, if you make a choice you regret, it is your fault for making the wrong choice because it is likely (or so we think) that the "correct" options were available but you chose the wrong. Carson presents some general work, and some personal works, and discusses some effective design principles. It turns out, that empathy is a natural inborn part of the human condition when it is not otherwise trained out of us. Indeed, such things as national, occupational and neighborhood pride are all outcroppings of this natural empathy. Rifkin suggests that we can tap into the natural ability to empathize to build a more peaceful and respondent global community. Wasik presents a wandering collection of stories that track the origin (often created by himself) through their short lived lives to their ultimate demise. During this process, he does some analysis on what made the various stories thrive for the short time before ultimately dying. Bdeir presents “Little Bits,” an electrical version of Lego. Zizek discusses how our current system of capitalism, which injects a strong element of charity into the system, is actually worse than leaving the charitable elements out. Pulling an example from our distant past, he suggests that the worst slave owners were the ones who were nice to their slaves as such nicety eliminated reasons for the slaves to reflect on the horribleness of their situation or to have a workable desire for freedom. Zizek suggests that we should rebuild society in such a way that instead of giving relief to the immediate problems, that we find ways to minimize the causes of those problems (prevention instead of charity). The "I Ching" sitting in all its glory on a table. I do not like the actual book much, so I was pondering why I keep checking it out. Here are the reasons I came up with. 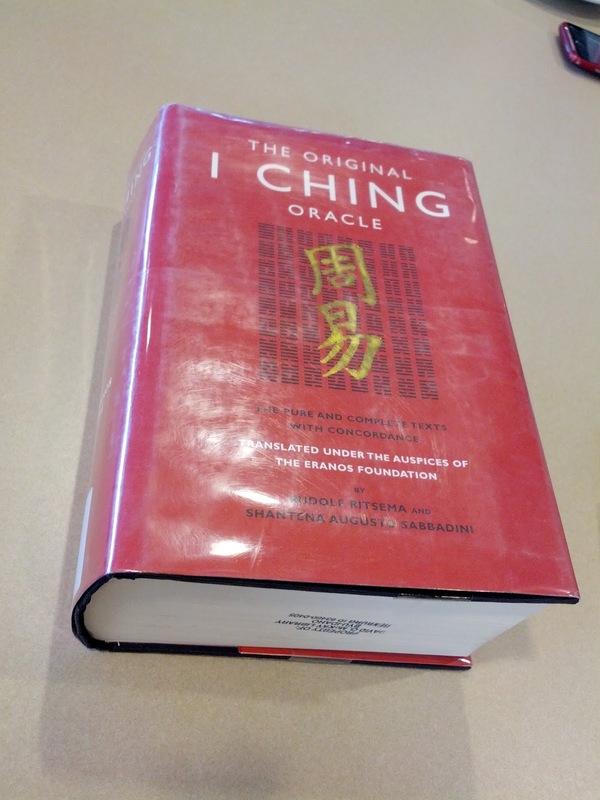 The actual title just begs respect for its simultaneous antiquity and epical nature: "The Original I Ching Oracle: The Pure and Complete Texts with Concordance, Translated under the auspices of the Eranos Foundation". How can I resist a title with "oracle," "concordances" AND "auspices" in it? The sheer thickness of the book. While Amazon.com reports an original copy to be 2.5 inches thick, I think the library copy has matured to a full 3 inches. A book that thick demands the respect of everyone in the vicinity. The giant Chinese character on the front. I generally get two reactions from people after they have comprehended the thickness of the book and the prominent Chinese characters on the front: "I am so sorry that you have to read that. What class are you reading it for so I can make sure to never take it?" or "Are you learning Chinese?" Sometimes when I get the first response, if I am feeling particularly mischievous, I tell them it is for the Capstone class (a class that, in theory, each graduate has to take after the first two years of schooling). The inside is filled with even more Chinese characters. I Ching fortunes can be fun to read and piece together. Fortune may be too strong of a word, they are more of guiding phrases and less of "fortunes" in the Fortune Cookie sense. Reading a lot of wise I Ching phrases allows one to then spout those exact or similar phrases back like, "white noise can bring both clarity and confusion" or "feed to hungry tiger before it finds a new master", thus sounding both profound and wise while not actually having said anything of substance. The I Ching brings me a bit of culture that I rather enjoy. While I would not recommend this book for reading, I would suggest it for browsing. It is fun to flip through its pages and read the bits of wisdom scatter throughout it. * On having bought Charley Harper: An Illustrated Life by Todd Oldham: I was going to include this in the body, but it got way too long. I guess it shows, in part, how much I love this book: I actually bought a slightly smaller copy, 12 inches by 8.5 inches by 1.5 inches, which i deemed more reasonable for the portability my nearby transient lifestyle currently requires. I bought it shortly before graduation, before I knew where I would be living after I graduated and after realizing that I did not know if my next library would have a copy of this amazing book and noting that I had nearly, single handedly, filled up the return date card. A cool dive into the world of quantum mechanics. This lecture talks about how we, as humans, use language to communicate, or miscommunicate, our intentions. Pinker provides some insight as to what is meant by it. For example, speakers use the veiled overtures to communicate on the safest level possible while relying upon the listener to read between the lines and progress the relationship if so desired. In this way, the speaker can signal interest in deepening the relationship without actually moving to the next level (which could destroy the relationship if the listener does not reciprocate). (This corresponds with Daniel's Levels of Relationships theory as a way to prevent the relationship level violations). In this lecture, Levitt and Dubner explore the Dictator Game (based on the Ultimatum Game) and its results. In the game, people are given $10 and told that they can give a portion (from nothing to the full $10) to another person, like themselves, in another room, whom they will never meet and who does not get any money except what the first person gives them. They found that the amount people were willing to give dropped (but stayed positive) once they added the option take (that is, remove from their wallet) a small amount money from the second person and then went negative when they added the option to take a full $10. In short, when we have a chance to steal a little money, we generally do not, but if we can steal a lot, we generally do. Robinson discusses what it means for a person to be “in their element.” It is, as most of Robinson’s lectures are, a discussion that includes educational ideas. We usually think of the internet as an amazing information source, and it is, but at the same time it is a huge filtering system. At the same time that information is being stored, companies filter our content based on our personal preferences. This creates three issues: we have a distorted perspective of what is happening (less sensational informational falls by the wayside), we tend to more informational junk instead of being balanced (we become informationally “obese”) and we lose control over what information we can get (operative word is “can,” as in it is hard to find information that the companies do not think you want). We tend to track, as Shermer points out, the hits and forget the misses. However, one must take the hits and misses together to determine if something is actually substantial. Shermer runs through a series of scenarios to demonstrate that people want to believe in extraordinary things, regardless of whether they are true or not. RSA Panel: Are Chronic Diseases Killing our Competitiveness? In short, chronic diseases have a strong, detrimental effect on our economy mostly because when people get sick with these nasties they are not able to be productive and cost lots of insurance money. Because molecules are smaller than light waves, we cannot see them (much less film them) to show what they are doing. Berry, with students, combined a knowledge of how molecules work with computer graphics to show, accurately, how the molecular machines work in our bodies. One may wonder of what use it is to listen to an atheist talk to atheists about being publicly open about their atheism. Quite simply, there are some good points raised. For example, Dawkins questions why religious topics are outside the realm of open discussion between scientists while all scientific topics are freely open to, and frequently abused by, religious authorities. While poking fun at religious cultures, Dawkins does raise some good questions about various dogmas. While I am not a fan of atheism (I think it is healthy to believe in something), Botton brings out some important points about religious rites can satisfy a part of everyone's’ life, even the atheists. He suggests that the next iteration of atheists, the Atheism 2.0, should augment their lives with such rites to find more enjoyment in life. You may recognize Gladwell from my reading list, I love his books. He is also a fun lecturer. In this lecture, Gladwell tells the story of the expansion of the spaghetti sauce business. From this story he launches into a deeper understanding of human psychology and how business misinterprets what people want. Gladwell describes some good data analysis tools as well. While it is a common to say that your problems and issues, Ehrenreich firms states that it is wrong and cruel to insist that bad things only happen to those who mentally focus on bad things and thus we need to think positively. Instead, she suggests, that we think realistically, hoping for the best but being prepared for the worst. Barry is a mentalist at work. Some elementary extraction of concepts but mostly good brain stopping fun. Meyer advocates a makeover of way we teach math. He identifies several areas in which we can improve our teaching methods, including some simple realignment of the curriculum. Meyer suggests that instead of training people to extract data from a problem (that only has the relevant information) and plugging them into a formula; we should train students to sift through information to find the relevant information, figure out what the answer they want and discuss through how they can get that answer from the available information. I love Jack Horner. He and I go way back. Well, not really. I read an article once that was an interview with him in which he discussed his Halloween preparation (which, apparently, are quite elaborate) and his work on the recently producer Jurassic Park movie in which he was consulted regarding the look and appearance of the dinosaurs. In this lecture: he discusses a realization (“Where are the little, as in juvenile, dinosaurs?”), a theory (that dinosaurs change over time much like their avian posterity) and a discovery (many of the ‘different’ dinosaurs are actually the same dinosaurs while they are growing up). An economic lecture in which Frank discusses how the current capitalistic model is likely to lead us to a place with massive corporation that have to act in extreme, economically and socially, bad ways in order to continue to compete. He attributes this to the evolution escalation principles identified by Darwin. In this principles, individuals do what helps them survive best, even if it is detrimental to the whole. For example, the antlers of the modern bull elk, measuring at some massive four feet wide, represent an enormous investment on the part of the elk. In order to compete, the other bull elks need to grow equally large, or larger, horns representing a similar individual investment. In the end however, if all the bull elks grew foot long antlers, they would all have the same relative advantage without the deep personal resource investment. To manage the some competitiveness in a capitalistic model, Frank suggests removing the income tax and installing a progressive consumption tax. Such a tax, he argues, would discourage the enormous waste that comes with lavish spending because it would in effect bring the upper end of the extreme to a lower margin. Instead of having to build a 4,000 square foot house to spend a million dollars (with most of the money going to the builder), you would only have to build a 2,000 square feet (with say, half the money going to the builder and the other half paying a consumption tax). Duffy, the monkey, was sitting quietly watching an army of ants work their way up a nearby log when he something caught his ears. It was a moan coming from a nearby clump of trees. Being a very curious monkey, Duffy went to go see what it is. He crept ever closer to the clump of trees trying to not make a sound. The moaning got louder and angrier with every step Duffy took. When he finally got close to the trees he stopped and wondered if he really wanted to know what was making the angry noises in the trees. Sometimes, when he was too curious, he would find himself in a lot of trouble. He really wanted to know anyway so he gently pulled back the bushes just enough to see the hairy back of a gorilla. Duffy smiled and thought of all the fun tricks he could play on the sleeping gorilla. Until, that is, the gorilla rolled over and Duffy saw it was Mildred. Now some gorillas can be nice, but most are a bit on the cantankerous side. Mildred was the most cantankerous of them all, especially when she was trying to sleep and she was always trying to sleep. Only the King of Kong himself would dare mess with her, especially when she was napping. Mildred looked like she was trying to sleep but she had a most peculiar way about her. Her eyes were closed and she was lying on some giant leaves but she was tossing, turning and flailing her arms in the air. Each time she flung an arm she moaned. It was the oddest sight Duffy had ever seen. Duffy was a generally good monkey who happened to get into quite a bit of trouble when he got too curious or tried to play pranks, and, being a good monkey, he knew better than to mess with Mildred so he decided he would leave. Just as he was about to let go of the branches and go back to the ants he noticed a blue flicker around Mildred’s head. He pushed his face through the small opening in the brush to get a better look: it was a butterfly fluttering about. It was one of the most beautiful butterflies Duffy had ever seen. It had dark blue wings with bright blue spots on the tips. Just then, Mildred’s hand went flying past Duffy’s nose and almost knocked it clean off. Duffy jumped back rubbing nose for the near miss. Creepy back to the brush, Duffy pulled the branches back again. Mildred’s fit made more sense: the butterfly was trying to land on her nose and Mildred was trying to keep it away. If she was successful, she would probably squash the poor thing. Duffy carefully reached through the trees and snatched butterfly just before Mildred’s hand swung again. Jumping back, Duffy cleared the branches and ran from the trees, just in case Mildred had awoken. Slowly, Duffy opened his hand. The blue butterfly gave a few quick flutters of its wings before taking off. The poor monkey was sad as he watched the butterfly fly away. Before he could shed a tear, the butterfly came back and landed on his hand. The butterfly slowly opened and closed its wings but said nothing. Duffy started to walk and think. He was thinking of all the warm places a butterfly could live in. As he was walking and thinking he heard another sound in the bushes. This was less of a moaning sound and more of a rustling sound of something trying to hide; it was coming from the nearby tumboa plant. Duffy sneaked around the tumboa and lifted some of the leaves, careful to not frighten the blue butterfly. Under the leaves was a small animal which was surprised to see Duffy staring at it. Slowly and sheepishly, the animal crawled back through the tumboa leaves until it was out in the open. It was a penguin, one of the last animals that Duffy ever expected to see in the Wu Kong jungle. The penguin’s eyes seemed fixed on the butterfly, and that made Duffy nervous. The little penguin kept going. Duffy wondered if she would ever stop even to breathe. The penguin did eventually pause for a moment, this time to look at Duffy who had just realized that the penguin had just barely realized that the butterfly was actually being carried. “Ah, hello,” Duffy said. The penguin stopped and started rocking back and forth while looking at Duffy. Her face lit up. Duffy was a little worried. It was one thing to get in trouble for a prank he played or for being too curious, but it sounded like he was in trouble for rescuing a butterfly from certain squashing. And that did not sound like fun. “Well then Duffy, shall we return Dott?” Pidg asked as she reached her flipper towards Duffy. Duffy paused for a moment and considered simply handing the butterfly over to the penguin and wishing her luck, but just then he heard a distant crashing of branches and he remembered the sleeping Mildred from whom he had rescued Dott. Pidg had probably wakened her up. Duffy knew that of all of the places he could be, the last place he wanted to be was wherever Mildred was when she was grouchy and he was sure the crashing branches meant she was grouchy. So, with a shrug of his shoulders, he grabbed Pidg’s flipper and tried to keep up with her as she took off through the forest. Strangers tell an average of three lies in the first ten minutes of their meeting. Most people would adamantly deny that they lie so often but most people would indeed be lying. Leslie suggests that we in fact need lies in order for society to continue. Self-deception is itself critical to advancing creativity and innovation. There has recently been a lot of research on choice, much of which is interesting. Salecl discusses how we used to think that choice was a liberating force, that the more choices on has, the more freedom and sociable they would be. We are finding that this is not true. Instead, we spend a lot of time being anxious over our choices and their moral and social implications. When we make the wrong choice, we feel strongly judged and by society, that we have somehow failed to live up to our humanity and we become ashamed of ourselves. When we make the right choice, we feel a bit of joy from making a good choice and then are plummeted into self-doubt about whether we actually made the right choice. Additionally, as we continue to make so many choices about consumption we begin to feel empowered by our consumption and thus liberated when in reality we have actually subjected ourselves to consumption and are not really the masters we thought we were. Specter has a very hard agenda that drives regarding the acceptance of science in our lives. Namely, he advocates that we be more informed before we dismiss science in favor for “organics.” Specter is clear to state that we should always have a healthy questioning of science, that is, that we should not accept everything science gives us. As part of this line of thinking, he suggests that we need to better the difference between correlation and causation. I was sitting in a meeting where we were discussing some of the finer points of a concept. Toward the end of the discussion, I raised my hand and noted that while we had discussed the benefits of the process, namely that it enables us to do "things" (the aggressive and ambiguous usage of the term "things" is an issue for another time) we had missed discussing how to do the actual process. While I had some vague idea on how to use the concepts discussed, I thought I, as well as the group in general, would benefit from a discussion of the mechanics of the process. It was interesting to me that the following comments started with words like "basically," "in essence," "mostly" and "it just happens." (I may have been a bit rude in my retort, "so I do these things and it just magically happens," to which I was met with blank stares and a humbled, shy 'yes.') I quickly realized that while each of the commenters seemed to understand the importance of the concepts discussed, they had little idea on how to achieve them. Perhaps more interesting was that they preferred to perform poor reductions rather than to actually understanding how to implement the concepts. We love to boil things down. We love to simplify and reduce. The problem is that when we artificially reduce things we lose a great deal of their power and effectiveness. In this artificial process, we remove pertinent content that would otherwise be valuable when in reality, we should focus on working through the problem until the simple and beautiful solution presents itself. This process should be a natural out cropping or development of the exploratory process, not a distinct or purposeful initiative to reduce the content. In other words, simplification should be a result of thoroughly understanding a topic. Instead of pursuing simplification, simplification should be more of a function of discovery or realization. Simplification that is discovered retains most, if not all, of the important information. They also contain the logic needed to address the broader application of the concept. In this way, we can more easily communicate the idea in its simplest, most beautiful form. It is not often that someone takes the heady concepts of deep science and brings it down to a level that the rest of us can understand. Greene takes the ever high concept of string theory and delivers it in a way that is easier to understand along with some updates on current scientific pursuits to proof the theory. This is a humorous lecture given with some serious underlying thoughts. Robinson outlines some thoughts about the education system and how it seems to strip child of the creativity. He argues that part of the reason for removing creativity is because sciences are revered as the “most important” subjects in school while the arts, and creative functions in particular, are considered lower forms of education and sometimes even despised. This hierarchy likely comes because schools were designed to make laborers, not thinkers. This book provides interesting insight into the value of interacting casually with people we never intend to get to know. People like the grocery clerk, the bus driver or mailman, each provide us with a sense of emotional stability, physical health and random information that is often valuable and difficult for us to obtain. Interesting tidbit: future employment is more likely to come from someone who knows someone you know than from someone you know. Robinson discusses the need to rebuild the underlying paradigm regarding our education system (he is English, but I think his views are still very applicable to USA). He proposes that we need to rebuild the system (a revolution) as opposed to progressing the system (an evolution). This is a call to start fresh. This book was an interesting exploration into the lives of everyone's favorite white bears. It was fairly comprehensive and included some interesting facts about species connected to the polar bear as well (i.e. seals, birds and other bears). Interest tidbit: Polar bear fur heat retention, when dry, is about 90% of that of the grizzly bear. Polar bear rely more on their fat storage than their fur coats for warmth. I recently completed an image creation project using Adobe Flash and Adobe Air. After spending many hours on the project I was exciting to find that I could get Adobe Air to work with the device’s built-in image saving mechanism (called the “CameraRoll”). That excited quickly disappeared as I found out that images saved with the CameraRoll were really lousy quality, small but lousy. After brainstorming on how to fix the issue, I discovered that if I changed the resolution of the project from 480x320 to 1440x960 (a threefold increase) that the quality issue became a moot point and the image size was still small. Enter problem two: I adjusted the stage to the new resolution easily enough, but I had to figure out how to increase all the assets threefold. This project has a large number of assets and the thought of scaling them all up was overwhelmingly daunting. Then I realized that I could just scale up the root object and, because everything but the stage is part of root, everything that mattered would also be scaled up. So, in an effort to share information with the world, if you find that your Adobe Flash project needs to be a higher resolution than when you first built it, and you want to avoid rescaling every element in your project, simply increase the stage size and add in some Action Script to scale up root (root.scaleX = 2; root.scaleY = 2;). Randi (The Amazing) is an entertainer by nature. While he performs some conjuring, as he calls it (he does not attribute his feats to magic), he adamantly argues that each of his, and everyone else’s, tricks have a perfectly natural, scientific explanation (though he does not care to share it). Though I am not a parent, this lecture still provided some useful insights. Taboo 1 was particularly insightful. The taboo is, “You can’t say you didn’t fall in love with your baby in the first minute [you saw them].” Conventional wisdoms says that you love your child the same from the moment they arrive on forever. Alisa commented (and they have a chart to show) that her love for their first child increased over time. Rufus, on the other hand, noticed that he loved their son less 6 months after birth but started an exponential increase a year after birth, meeting Alisa at about year two and remaining in step with her. Here is the great insight: as Rufus made the observation of his reduced and then skyrocketed love, Ailsa commented that she thought this might be because there was little Rufus could do to tend for their new son during those first months. Later, as their son got older, Rufus could care for and play with him more, thus increasing his love for him. They told me it would be the same, I did not believe them. They told me that I would not be able to tell the difference, I could. They told me that I would love it, I did not. The only reason why I got the innocent looking "zero" was because they were out of the normal, "some" mouth wash. The bottle claimed it did the same thing but with no alcohol and thus was less intense. I carefully noted during my first use of the "zero" version that the liquid had a dubious creamy texture to it. It made me seriously question the cleansing power of the purportedly marvelous mouth wash. Could it really be as good while feeling like my mouth was being in a protective coat that "some" did not leave? Perhaps I told myself, perhaps. Maybe, the creamy feeling was like a wax coat that protects a car from damage. Maybe, the film would help keep the bad stuff from eating my teeth. Maybe, but I was still doubtful. Eventually the store got the old kind of mouth wash back in. I was tempted to buy a new bottle, but what would I do with the partially used old one? Pour it down the drain? I could hardly stand the waste, especially since I was already a quarter of the way into the bottle. "I can manage to finish this off," I told myself. Thus entered the self deception; no longer were they trying to convince me of anything, instead, I was doing all the convincing. It tasted the same as the other mouth wash. It did its job better than the old mouth wash. I did not need to feel the nasty burn of the alcohol. I was good with the protective coat that felt like a thin film of mucus embalming my mouth every morning. It was all good, every last bit of it. As I inducted "zero" into my routine, I am sure they thought they had me. I even thought it was a glorious new feeling. I need not fear breathing into a roadside breathalyzer (not that I ever have before). I need not fear suspicious looks when I breathed too hard (no, I would still worry about if my breath smelled good or not). This, the "zero" was the good stuff in life. I had it, I used it and I loved it. As the days moved on, I noticed that the bottle was slowly being depleted. While I delayed the question as long as I could, I knew I would eventually have to face it: would I replace the "zero" with "zero" or with the real stuff? I did not want to have to decide, not yet. "Zero" was so good to me; I did not want to kick it to the curb. Though there was still a gentle nagging of disbelieve in the back of my mind: was it really as good? If it was, why did it take so long to get "zero" to market? Is the thicker, creamy "zero" fluid really just as good as the original? Why had they not switched all of their products to it? Compounding these questions was the fact that I did not care enough to actually research any of them. This is, after all, mouth wash, not investment funds or a substantial enough purchase that mattered enough that I could justify spending some time, any time, doing some research in the differences between "zero" and "some." 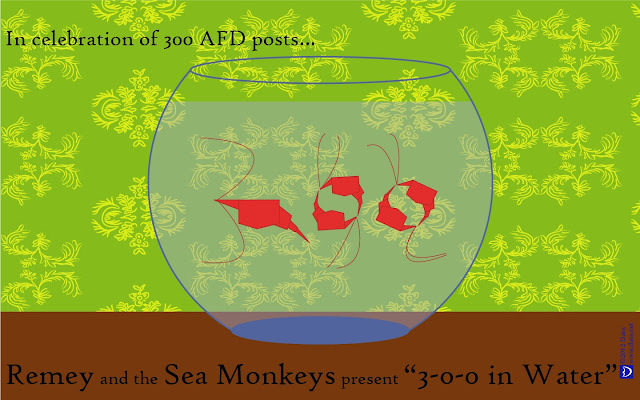 I found that the fateful day was approaching quickly: the day I would run out of "zero." Projections indicated that I would run out sometime mid week and thus I would need to buy a new bottle in the next round of shopping lest I be caught empty handed. The final decision was not as hard as I thought it would be. My heart jumped when I saw the "some," mouth wash sitting casually next to the "zero." My hand grabbed a bottle of "some" without thinking. I knew that I would not be using the new bottle for a few days so I thought little of it. "It is virtually the same thing anyway," I tried to tell myself, "no need to rush into the new bottle." The projections were correct, it was on a mid week morning that I ran out of "zero." This meant that it was after dinner that evening that the "some" was busted out. I was curious about how I would take the original mouth wash. What if I hated it? What if "zero" really had been all it was supposed to be, and more? What if I missed the protective film? I gave close attention to the sensations in my mouth as I tilted my head back and poured the liquid in. The difference was immediate: it was as if "some" (the original) was a light, thin fluid flowing in between every bud on my tongue and to every nook and cranny in my mouth. Where "zero" had feared to go, "some" did not care, in fact it cleansed with the fiery vengeance that only alcohol can bring. I had forgotten the burn, but as my eyes welled up with tears I began to remember. As I swished the liquid in my mouth, it felt so incredibly thin and agile, liked it wanted to go everywhere and get to everything, something that "zero" had been too timid to do. Even the burn felt good, not that I am a masochist, but there is a comfort in feeling that something is actually working instead of just hoping it is working, something "zero" made me take on faith. As I spit the liquid into the sink I noticed that the film left by "zero" was not there. Instead, I was left with a clean, invigorated feeling mouth, as if my very pores had been cleansed. In the end, they were all wrong: "zero" was no substitute for the real thing. Hodgman’s lecture has little intellectual value, but is still rather entertaining in a high class way. In addition to providing some tips on identifying some of the signs of deceit, Pamela advocates the pursuit of truth. She commented that deception is always a game for two: the one deceiving and the one who accepts the deceit. By changing our attitude from accepting deceit to one who accepts truth we can step away from the biologically programmed game and enjoy a more fulfilling life. Contrary to popular business practices, employees do not perform better just because they are offered more money (often in the form of incentives and bonuses). This methodology is holds true for basic manual tasks but it actually hampers productivity and creativity for problem solving and solution finding. Dan Pink gave the lecture twice, once at TED and once at RSA. The RSA also made a short, illustrated recap of his lecture. An interesting examination as to how genetics can effect our mental disposition. Honestly, I did not like the book too much as the author tried to weave threads of personal drama into the text, after which I would look up and wonder why she had wasted my time with the personal interlude. Interesting tidbit: Something happens in the brains of young people between 20 and 25 that significantly decreases the chances of them remaining religiously vigilant (beyond going to church because their parents tell them to). I have noticed that as of late, I have not had a lot of time to read but I have been able to watch (or listen to) some really lectures and presentations. I will start, in the near future, posting notes on these lectures similar to the Readings. I think I will call Viewings. Apparently, telling lies is a deeply rooted evolutionary trait instilled in our DNA for a very long time. The book covers a variety of ideas on why we are so good at telling lies, including a long section about self-deception and some ideas on why we are so good at hiding information from ourselves. Interesting tidbit: The average person tells three lies every ten minutes, many of the lies the individual would not consciously recognize that they were telling a lie at the time. Another essay. This one is geared towards making sure that data presentations address the correct questions and show the data in a way that allows for a quick and accurate analysis of the given data set. The essay features a combination of original data presentations (such as documents from the Challenger accident) and remakes of the presentations that allow for a better understanding of the data. Interesting tidbit: Data does not bear out the famous conclusion of the 1854 London Cholera Epidemic. Namely, new cases cholera were already on the decline when Snow removed the infamous water-pump handle. This is hardly a book at all, but is more of an essay. It is a wonderful summary of why one feels discontent and ill informed after sitting through a lengthy PowerPoint presentation. Tufte starts with a detailed accounting of the communication processes that led to the Challenger accident. He then proceeds into many common presentation flaws commonly made and he even includes some suggestions for compensating for those flaws. Interesting tidbit: NASA engineers were required by policy to provide technical analysis (not just the conclusion) in PowerPoint. I truly love Tufte (someday I will own his books and will no longer need to share them with the library). Where Visual Explanations was about using images to explain data, Envisioning Information focuses on conveying information in a way that allows views to quickly process data sets. Interesting tidbit: Many techniques of data presentation have degraded tremendously as data presentation tools have entered the main stream. For example, think of how many times 3D bar charts are used in a way that makes it difficult actually compare difference of numbers. Your attention please! The Ithamar Limited presents a trip to the Grand Canyon through Las Vegas, Mesa Verde and Hovenweep. In making data presentations, it is all too easy to make them overly complicated while not communicating any data of real value. Much like How to Lie With Maps, this books serves to try to reduce presentation error. Tufte admonishes designers to steer away from cute but inaccurate graphics, removing "chart junk" (styles or designs that distract from the data by making it more difficult to read) and killing "ducks" (which he describes as "when the data measures and structures become Design Elements, when the overall design purveys Graphical Style rather than quantitative information"). The book has a series of solid graphic design principles that can help reduce "ducks" and present data in clear, more readable layouts. Interesting tidbit: Tufte is a strong advocate of altering line shape (mostly widths) on maps to communicate additional information rather than create new data sets. A prime example is Minard's map of Napoleon's march where the line angle is the path of travel, width is the size of his army and color is the direction of travel (brown is advancing and black is retreating). Of all of the design books that I have read (which are a few), Tufte's are the best. I love his analysis of display, presentation and layout. I do not know when I first read a Tufte book, but I think his works have had a more profound effect on my skills, rather my application of those skills, than any other author or class I have ever taken. As I have been posting my Reading to this blog I took it for granted that everyone has read and enjoyed Tufte books. Then, one day, it dawned on me that I should stop assuming that Tufte is a household name (though I have been surprised the contexts in which I have heard his name) and share my readings of his works too. I have prepared several Reading posts about his books. It is Calvin and Hobbes. How much better can life get than curling up under a warm blanket or lounging under the sun reading the imaginative adventures of a young boy? A delightful collection of visually intriguing ideas and concepts. The book is rich in images collected from a wide variety of places, each with some insight about concept and application accompanying it. It is not just a good table piece, but also a fun way learn new ways of looking at the world. Interesting tidbit: Pacific Islanders used shells, rocks and sticks into their fishing nets that they used as a map of the islands, currents and winds. A collection of fifty case studies in brief of advertising and design work preformed by Pentagram Design. The book is a bit more than most advertising book that merely through a serious of their "best" ads at the reader. Instead, they go into depth about the theory and principles behind the way they designed, including some analysis about what worked and what did not. This is not a book that one would sit down and read, rather it is a book to flip through and stow away the images with an increase in knowledge about good design. Interesting tidbit: Pentagram Design was responsible for the Celebration, Florida. The special city built and maintained by Disney. After scrapping through another semester, it is my pleasure to enjoy the fact that it was my last semester (until a Masters, but that can wait a little while). Now, I get to enjoy the splendors of Eastern Idaho in the summer (truly one on my favorite place the summer; indeed, it is why I put up with the snow). Rest assured, I will not be just playing: I will continue to work (that 'job' thing), work on projects (also known as: unpaid work), hopefully write more often (I am a little scared that I can no longer blame school for a lack of writing, I guess I need to find a new excuse) and enjoying the wonders of the mountains (I hope to find more caves). A fun research article that analyzes the walking styles (also known as "gaits") of various animals. The article especially focuses on the gait differences between primates and other mammals. The article can be found here http://jeb.biologists.org/content/209/11/2042.full. This book explores the process we go through to make choices. It includes an analysis of why many people make the decisions they make and why they avoid others. There is a hefty discussion about people insisting on being able to make decisions, even though they do a poor job at making them (think health care, in which common people decide about their medical treatment despite being in the care of a highly trained doctor). Even though they make poorer decisions, they are happier for the opportunity to make them. Interest fact: Reactance is what happens when a freedom is eliminated or threatened, people revolt by expressing the newly removed or forbidden freedom as a rebellion. I recently completed another picture in my series of graphics (someday I will name them so that I can more easily refer to them). Once I am done with the graphics I have to export them to raster images so that the photo printer can print them. Previously, I have had to export them at 450 DPI (dots per inches, in printing lingo: the higher the DPI, the better the picture). While 450 DPI is good (most printers can only handle 300 DPI), I would always rather store the images at a higher DPI than a lower one but the graphics software could not handle a higher DPI. Then I found out that I just needed to open my Illustrator files in Photoshop and use Photoshop to export the images. Now I am able to enjoy glorious 1000 DPI. I know that such is beyond all reasonable uses, but I still take comfort in knowing that they are well preserved. 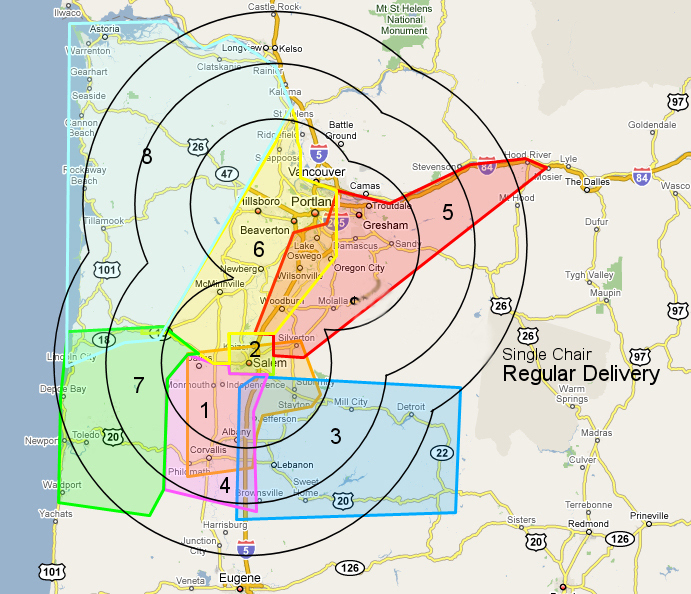 Some years ago I produced a delivery map for work. The map was glorious and communicated what days we delivered where, how often we delivered there and the price that we charged for the delivery. 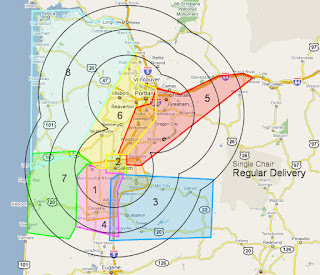 The map was a critical part of selling delivery to our customers and allowing the salespeople to correctly communicate delivery expectations to their customers. A few years after releasing the map, we upgraded our systems to an automated routing system that would control the delivery schedule and charges based on the Zip Code on the sale. I stopped updating the map because it was inaccurate compared to the upgraded system in that it allowed for the personal interpretation of the schedule and delivery charge for the borderline cities, interpretations that would not match up with the system’s automated schedule and charges. Additionally, the map was built using old graphic software and we would need to spend several hundred to purchase new software and spend several hours to rebuild the map. I fought the request: it would be expensive and would surely lead to several upset customers and salespeople. Then it struck me: they did not want a map (that was all they knew); they wanted to be able to easily know when we go where and how much it would cost. I proposed an easy to maintain spreadsheet and was greeted with an overwhelming response in the affirmative. In fact, the salespeople preferred the spreadsheet over the map. This provided a valuable lesson to me: give them what they need, not what they want because often they do not know what they really want, they just know what they had. A fun discussion on various techniques that can be used to lie using maps (as the title implies). The book is not as devious as it sounds; part of its intention is to help map and chart makers avoid simple mistake and help more effectively communicate information (some information should be suppressed to avoid overwhelming the viewer). There is also some use in knowing how people might use maps and charts to lie so that the contemplative user can more intelligibly discern when he is being deceived. Interest fact: Ottawa Canada was left off of a AAA tourism map because it did not have direct international flights, even though it is a major Canadian city. Recently, I took an opportunity to tour a performance venue and enjoy the view of the performance from the camera room and Production Control Room, a place that few people get to see. While I was sitting there, I realized that had I had a “Bucket list,” that amazing experience would not have been on it because it did not even cross my mind. As I have pondered back on the many adventures I have had, I find this to be true of most of them; most of my adventures I had not known enough about a year or more prior to know about, much less think “I want to do that someday.” I often consider what life must be like for people who have hopes of their greatest life adventures in some decades to come. More importantly, I consider what life is like when those adventure milestones are never met. Instead of pushing all my hopes and dreams into the future, and possibly ending up with regret over the adventures I could have had but put off, I would rather take the adventure in the reasonable now. Furthermore, I think that if I already had a list of adventures to have in the decades to come, I would stop looking for new adventures, ones that I had never thought of before. I guess, in the end, what I am really saying is: instead of bottling up perspective adventures and holding on to the notion that they will come someday, people should seize the adventure while they can. This will let them hold to the memory of the actual adventure instead of the notion of what is to come. It also means that the adventure is done and cannot be undone, unlike adventures that are yet to come which could easily never come. Also, living now shows faith enough in your life that there will be adventures later too. Instead of hording them all away, thus meaning there are fewer adventures, living freer means the adventures will come freer too.